A Russian resupply ship left the International Space Station today after 166 days attached to the Pirs docking compartment. The trash-filled Progress 60 (60P) undocked from Pirs at 2:35 a.m. EST/7:35 a.m. UTC and will re-enter Earth’s atmosphere a few hours later for a fiery destruction over the Pacific Ocean. Pirs will remain vacant until Wednesday morning when a new delivery spaceship arrives and docks to it filled with science and supplies replenishing the Expedition 46 crew. Russia’s Progress 62 (62P) will take a two-day trip to the space station after launching Monday from the Baikonur Cosmodrome in Kazakhstan at 3:44 a.m. EST/8:44 a.m. UTC (2:44 p.m. Kazakh time). Expedition 46 Commander Scott Kelly and Flight Engineer Tim Kopra are expected to conduct a spacewalk a few hours after the launch to reposition the mobile transporter and lock it in place in advance of the 62P’s arrival to the station Wednesday morning. Live NASA Television Monday will resume at 6:30 a.m. in advance of the spacewalk expected to begin at approximately 8:10 a.m. 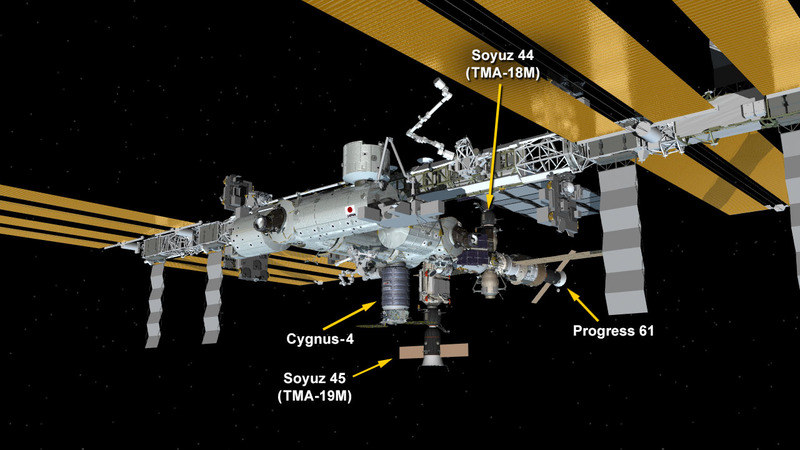 The departure of the 60P this morning leaves four spacecraft docked to the orbital laboratory. The Soyuz TMA-18M crew spaceship is docked to the Poisk module. The Soyuz TMA-19M is docked to the Rassvet module. A Progress 61 cargo craft is docked to the Zvezda service module. The Cygnus private space freighter from the U.S. company Orbital ATK is berthed to the Unity module. Wow, will be keeping up to date with this, great to hear the mission is going well so far. Glad to see everyone is safe and sound.